This native shrub from the Bloomfield River has been planted near E1. It is easily recognized by the firm, narrowly lanceolate leaves to 8 x 1.5 cm, which arise in whorls of 3. the leaf midrib is pale often with a pink tinge, some old red leaves may be present. Flowers and fruits are clustered in the upper axils. Flowers whitish with numerous stamens to 2 cm long; fruit is a woody capsule to 1 cm diameter. This shrubs adapts well to pruning. 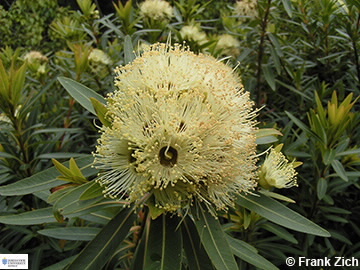 This species is also known in nurseries as White Penda.